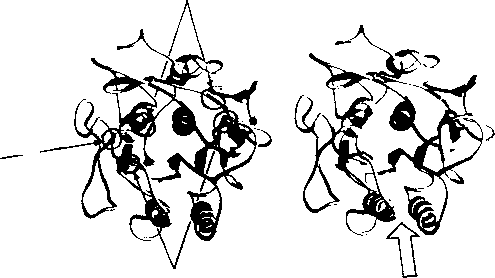 FIGURE 10-27 Completed predicted structure of the GR HBD family, based on an alignment with thermitase, in crossed stereo. The original structure is in color, therefore some details are not obvious. Locations of contacts and point of entry of the steroid molecule are indicated by the current authors of HORMONES. The model is reproduced by permission from Goldstein, R. A., Katzenellenbogen, J. A., Luthey-Schulten, Z. A., Seielstad, D. A., and Wolynes, P. G. (1993). Three-dimensional model for the hormone binding domains of steroid receptors, Proc. Nat. Acad. Sci. USA 90, 9949-9953. 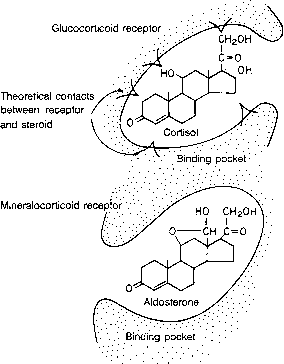 FIGURE 10-28 Speculative views of the binding of Cortisol by the glucocorticoid receptor and of aldosterone by the mineralocorticoid receptor. FIGURE 10-29 Potential structures of soluble aldosterone and structure of the antagonist, spironolactone. aldosterone-secreting system is not the only system controlling water balance. The topic of water homeostasis is covered in Chapter 15, where the mode of action of aldosterone is reviewed, and in Chapter 4, where the actions of vasopressin are presented. This system is diagrammed in Figure 15-7. The initial signal is a fall in blood volume, a decrease in Na+ concentration in blood, a fall in blood pressure or release of catecholamines (stress) at the juxtaglomerular apparatus of the kidney, or the effect of angiotensin II. Any of these stimuli causes the release of renin, an enzyme with proteolytic activity, from juxtaglomerular cells. Renin acts on a plasma a2-globulin, releasing an N-terminal decapeptide by hydrolyzing, at a hydrophobic sequence (amino acids 10-13), a leucyl-leucyl peptide bond. The resulting decapeptide is angiotensin I, an intermediate with no hormonal activity. Angiotensin I is then attacked by a converting enzyme, which has a broad distribution in the vascular epithelium, lung, liver, adrenal cortex, pancreas, kidney, spleen, and neurohypophysis. This enzyme is a carboxypepti-dase that cleaves off the carboxy-terminal dipeptide, His-Leu, at a peptide bond connecting Phe and His. The resulting dipeptide is inactive and the octapeptide is angiotensin II, a hormone. This hormone has a short half-life of about 1 min because its activity is destroyed by angiotensinase, a Ca2+-activated enzyme found in the peripheral vascular beds. This hormone, in addition to its effects on zona glomerulosa cells of the adrenal cortex, sensitizes vascular smooth muscles to the contractile effects of norepinephrine. There are specific outer cell membrane receptors for angiotensin II in the zona glomerulosa of the adrenal cortex. Binding of the hormone to the receptor causes enhanced PI cycle turnover, with the activation of phosphatidylinositol protein kinase. In addition, ACTH binds to its receptor on these cells and elevates cAMP and PKA. Both pathways work in concert to stimulate aldosterone synthesis. Apppreciable levels of aldosterone are generated, primarily during stress.